– The match took only 54 minutes. – Grigor Dimitrov only won 18% (2 of 11) 2nd serve points), and never created a break point chance for himself. – I must have watched that match, since I watched most of Shanghai…yet I don’t remember a single thing about it. 1. Can Grigor Dimitrov protect his serve effectively? He clearly didn’t in Shanghai, and not doing so today would be disastrous. Can he summon any of the numbers that prompted me to write this? I think he needs to win at least 70% of his 1st serve points, and 50% of his 2nd serve points to have a chance. 2. Will Djokovic look to target Dimitrov’s forehand or backhand? The single-handed backhand seems like the obvious choice, but one never knows what Novak Djokovic will do. Against Fognini Djokovic refused to engage in many forehand rallies, to the puzzlement of many. 3. If things start going badly for Dimitrov…can he keep fighting to turn things around? The Bulgarian is not known as a fighter, and many players tend to cave in if Djokovic is in imperious form to start the match. This is a good opportunity for Dimitrov to show that he’s definitely one of the young guys to look out for this season and beyond. The men are on the court, and Fergus Murphy is in the chair. We should be starting in a few minutes! First Set – Grigor Dimitrov will serve first. 0-0: Dimitrov opens with two straight aces. A good omen for his chances. Two Djokovic UFEs later, and a love hold is achieved. 1-0, Dimitrov: Djokovic responds with his own love service game. Things moving quickly. 1-1: Dimitrov races to a 40-0 lead…and double faults. First point “won” by the returner in this match. A Djokovic FH UFE later, and it’s a simple hold to 15 for Dimitrov. Dimitrov has come out the gates serving very well, which bodes well for his chances, as well as for the Stadium 1 crowd’s chances to see a competitive match. 2-1, Dimitrov: Djokovic opens his service game with two straight BH UFEs. Both cross-court, too. Shaky start for the 2-time Indian Wells champ. It gets worse, as Djokovic double-faults to give Dimitrov 3 BPs. 0-40. Djokovic saves the 1st BP with a service winner, but then sends a CC FH UFE well long. Dimitrov with the opening break! Dimitrov, sporting a half-baked goatee, forces the early break against Djokovic, with the Serb quickly going to his bag to change equipment. 3-1, Dimitrov: The best returner in the world has managed to win all of 2 points on Dimitrov’s serve so far. And one of those was a Dimitrov double-fault. Dimitrov holds calmly at 15, in a game that included two more FH UFEs from Djokovic. A pretty poor start for the World Number 1 does not get better. Dimitrov is holding very easily, and the UFEs are coming from all sides for Djokovic. Stats Update: Thanks to the nice TennisTV stats, I can tell you that through 4 games, Novak Djokovic has won only 3 of the 11 baseline points played. And he’s committed 83% of unforced errors (10 of 12). 4-1, Dimitrov: Two bad UFEs and Djokovic is once again down 0-30. He then punishes a couple of short returns, and it’s 30-all. But Djokovic seals the hold to 30 with a service winner. 4-2, Dimitrov: Djokovic creates an insane angle from the middle of the court with his FH to get his first half chance in a Dimitrov game: 15-30. A blistering serve makes it 30-all, though. This is a nice test for that Dimitrov serve – he absolutely has to take this set, given how poor Djokovic has been. However, it seems like Djokovic is not missing anymore, and we’re at deuce for the first time in the match. AD Dimitrov after a good wide service winner. The men have a fun rally, which ends with a FH UFE by Djokovic. Stats Update: Through seven games, Djokovic has 8 FH UFEs and 5 BH UFEs. Dimitrov? Just a single FH UFE. 5-2, Dimitrov: Djokovic holds at 30, in a game that included another DF, but enough good serves to force Dimitrov to serve the set out. 5-3, Dimitrov: Dimitrov starts with a double-fault, but follows it up with his 3rd ace of the match. However, that is followed by another DF, after the Bulgarian goes for a huge 2nd serve up the T. Needless. 15-30. Now Dimitrov double-faults AGAIN, after his 2nd serve clips the net. 2nd serve coming at 15-40. But…another bad Djokovic FH UFE erases that first BP. Incidentally, that was the 1st rally of the game. However, Dimitrov double-faults yet again, and Djokovic breaks…though Dimitrov did all of the breaking himself. Four double faults from Dimitrov to had back the break. Even Maria could never. @juanjo_sports I can add that to my having won as many Tour de Frances as Lance Armstrong. 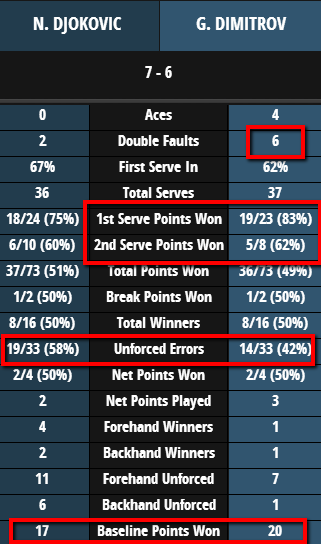 Stats Update: Without the double-faults, Dimitrov had won all but 4 points on his serve up to that fateful 5-4 game. Lost only 1 point played on his 1st serve. 5-4, Dimitrov: Djokovic holds in a minute and 25 seconds. At love, naturally. Truth RT @AmyFetherolf Failing to serve out a set against Djokovic? Maybe Grigor really is Baby Fed. 5-5: Dimitrov with a much, much needed love hold. The serve worked well, as it had in every single game except that 5-4 disaster. 6-5, Dimitrov: Dimitrov has a short ball at 40-15, but nets it. On to Tiebreak City! Tiebreaker – Grigor Dimitrov will serve first. 0-0: Dimitrov double-faults. Again. His sixth DF of the match. MINIBREAK. 1-0, Djokovic: Djokovic with a nice BH DTL that draws a FH error from Dimitrov. 3-0, Djokovic: Another sweet BH DTL by Djokovic forces another FH error from Dimitrov. MINIBREAK. 5-1, Djokovic: Dimitrov with a huge FH winner from the middle of the court. MINIBREAK. It barely caught the line. 6-2, Djokovic: Djokovic conceedes the point after a 1st serve winner was called out, and the challenged proved successful. Nice sportsmanship from the World Number 1, as he was clearly beaten by the serve, even if he did get a racquet on it. 6-3, Djokovic: Djokovic lines up a BH DTL…and misses it. MINIBREAK. 6-4, Djokovic: Djokovic takes the set after pounding Dimitrov’s BH with his inside-out FH. 0-0: Djokovic with a straightforward hold to 15. Djokovic won a set in which he won fewer baseline points than his opponent and hit 19 UFEs. Basically because his opponent double-faulted 4 times when he had a chance to serve out the set. Oh, and said gentleman also double-faulted to start the 1st set tiebreaker. 1-0, Djokovic: Djokovic starts peppering Dimitrov’s BH, and finds himself with a BP. Which is erased by a HUGE ace out wide. Deuce #1. Another Dimitrov BH UFE and it’s BP #2 for Djokovic (in this set). A very loose FH UFE from Dimitrov gives Djokovic the early break in the 2nd set! 2-0, Djokovic: Djokovic double-faults at 40-0, and then goes for a big FH that just misses. 40-30. A service winner clinches the game for Djokovic, though. As I wrote above in the “Things to Watch for”, I would like to see some fight from Dimitrov, given how badly things have gone for him. Or at the very least I’d like to see something from him that would indicate that he’ll at least graze the top 10 at some point in his career. At least that tells you that Dimitrov was playing with the right tactics in mind. But not even the best gameplan in the world is immune to 4 double-faults when serving a set of tennis. 3-0, Djokovic: Dimitrov threatens to go down a double break, after poor errors make it 0-30. But the Bulgarian comes back to hold at 30 after Djokovic sends a BH return tamely into the net. Stats Update: Through the first 3 games of the 2nd set, Djokovic has now gained the upper hand in baseline points, albeit only by one. However, it doesn’t seem like Djokovic committed a single more UFE, while Dimitrov now collects 20 of his own (6 of which are double-faults). Djokovic still leads the FH UFE “race”, 13 to 9. 3-1, Djokovic: Djokovic holds comfortably in a game that included a very nice passing shot hit from the service line. Loved how Djokovic took his time to settle his feet, take aim, and pummel that BH. Dimitrov got a racquet on it…but his shot had no chance of going over the net. 4-1, Djokovic: Dimitrov sends a BH into the net, and then a FH long. He’s down 15-40, and gets broken again with another tame BH UFE. Another very sad game for Dimitrov, who has apparently checked out of this match. This is exactly what I didn’t want to see from him today. Game, Set and Match to Novak Djokovic, 7-6(4), 6-1. Everything was going very well for Grigor Dimitrov – right until he walked towards the baseline to serve out the first set against the World Number One. The young Bulgarian had served extremely well up to that point, and was set to punish a thoroughly sloppy Novak Djokovic, who was gifting points left and right. In simple terms, Dimitrov had played well enough to take the set, and Djokovic played badly enough to lose it. And then… the double faults happened. Four of them, to be precise. 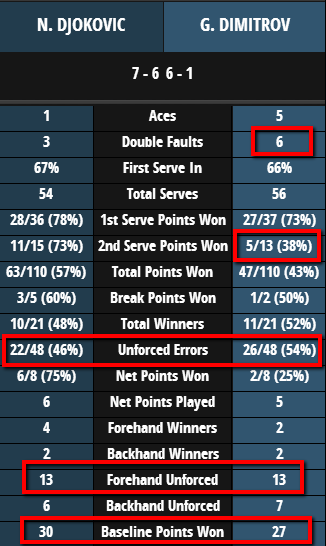 Dimitrov broke himself, and even if he produced a nice service game at 5-all, he started the very key tiebreaker by double-faulting. In a blink of an eye, Djokovic was up 5-0. To make matters worse, Djokovic stopped being mediocre, and quickly went up a break to start the 2nd set. At that point, the match was over, and Grigor Dimitrov never threatened again. If you look at the way Dimitrov played up to that 5-3 game, you could say that yes, the Bulgarian surely looks the part of a contender for the future. But what to make of what happened next? What to make of Dimitrov’s inability to regroup? What about the way he folded against an opponent that was practically begging him to take the first set? Djokovic had barely managed to win points on Dimitrov’s serve (all of five, to be precise – and one was a double fault), yet Dimitrov found a way to hand over his break advantage in the worst possible way. If Grigor Dimitrov was 18 years old and this was his first ever big-time match… I get it. But it wasn’t. He’s been around enough times. He’s been a pro for enough years. He’s at the stage of showing something closer to a finished product instead of just twenty minutes worth of competence. This might sound harsh, but at this point, I’m not expecting anything big from Grigor Dimitrov. Which is a pity, because the Bulgarian is certainly not lacking in talent. Now, about the man who just won his 20th straight match: I’m not quite sure what to make of his level at Indian Wells so far. Judging by Djokovic’s comments, he’s not all that fond of the slow, high-bouncing surface. This is not really a surprise, given how content he seemed in the way faster surface laid out in Dubai, and on the much faster Australian Open. Still, whatever was bothering him in the first set should have cost him a set: he was that bad during it. And Djokovic should know by now that giving away a set in a M1000 can be a very dangerous proposition. Yes, Djokovic did go from 19 unforced errors in the 1st set (think about that number for a bit), to just 3 in the second. He was competent to close out the match, no doubt about it. But his opponent had already checked out of the match, so it’s not like things were overly complicated. Up next is Sam Querrey, who is the last man to beat Novak Djokovic, and the last man to beat the Serb before a final, since Andy Murray did it at the Olympics last year. That was a long, long time ago. Querrey played a very tough three-setter against Marinko Matosevic, but will surely feel encouraged by what Djokovic has shown against Fognini the other day and against Dimitrov today. Plus, Sam is bound to have the crowd in his favor in what is set up to be an intriguing night session at Stadium 1. ASDJSJKFHAf he double faulted four times. HE DOUBLE FAULTED FOUR TIMES! Yep. He did. It was pretty sad. When Dimitrov double-faulted four times at 5-3, I began wishing that I had skipped this match in favor of checking out the end of the Haas-Almagro match. That wish only grew even stronger as the match wore on; at least Djokovic quickly put Dimitrov out of his misery in the second set. Agreed on all counts, Ophelia. One of the main reasons I wanted to do LiveAnalysis on this match was that I wanted to see something new from Dimitrov. And for 8 games, it seemed like I got my wish. Instead, he flopped in the worst possible way. I would say I wish I had watched Almagro-Haas instead, but I’m thankful I missed out on yet another heartbreaking loss for Almagro. First, watched Novak’s interview for Skysport after the match, and he said that the rebound was very high (then, they showed how he used this rebound to neutralize Dimitrov’s BH) and that the court was slowed, a bit slower than the previous years. A minute later, I had Berlocq winning the first set against KN, both player 10 feet behind their baselines. Then, I remember the way Haas and Almagro played — looked like true CC tennis. Then, another thing: Dimitrov is often compared to Federer. In fact, watching him now, I think he has improved since his last match against Novak, in November. He probably serves a bit better, his FH looks a bit better too. He could have a similar breakthrough like Federer had at 22. But one thing looked obvious to me: he doesn’t move well. He is often late for his FH, his BH, his defence is virtually non-existent. Thanks for this, mat4. Yep, Djokovic did not appreciate the high bounce of the day conditions (yesterday he played his best set of the tournament at night against Querrey). Except for the part of Indian Wells being on cement, they’ve done a pretty good job of making the bounce on the court resemble that classic clay bounce. In terms of speed, I actually think IW plays even slower than a fast clay court like Rome, for example. About Dimitrov…what’s more to say? It all looked great until 5-3. I think he had 1 UFE. Everything was clicking. And then, after his collapse, the errors started mounting, and it all fell apart. I agree about the movement – he definitely finds it hard to get back into a point when he’s being attacked. And that trait is essential to get into the top 10. You have to be able to counterpunch. Maybe something clicks inside Dimitrov. Maybe it doesn’t. We’ll never know, at least for a while. There’s always hope. I found an interesting article on ESPN about Novak’s new Head racquet: it is ligher 8 ounces, but has more swingweight. Usually, when you change your racquet, in the first period you try to adapt the racquet to your game. It worked well for Novak both in 2011 and in 2013: his innegra racquet was very similar to the old one, but it gave him more control of the ball, and he felt well about this one too. But after that, you try to use all the possibilities of the new racquet — and it can take some time. Watching Novak in Dubai and now, in IW, it seems that he has to rethink his court positioning and the way he uses spin: he can hit much harder, but he has to stand a few feet behind the baseline, otherwise the ball will sail long. Since the racquet is lighter, he has to develop more spin to keep the ball in the court too. We had glimpses of the new things Nole can do: a better, fast FH; a better slice; a better kick serve. But it just doesn’t still function well enough. I’m actually quite cynical about these racquet changes, particularly when they’re within the same brand. The brand needs to sell a new stick every year, and the pro usually gets a new paint job every year. I think Djokovic and Head worked hard enough to get a stick that works for him, after the horrors that started with his switch from Wilson. But I’m pretty sure that whatever he ended up with is not what is being sold in stores. Someone from Twitter sent me a link to a forum where this guy compared the racquets pros actually use to the ones they “advertise”. I remember that in Djokovic’s case, the differences were quite significant. I actually don’t think anything has changed from last year to this year – the variances in Djokovic’s game still have to do with his focus and his ability to control his frustration. We saw it yesterday against Querrey, where he played a God-like 1st set, delivering a bagel to poor Sam like it was the easiest thing. Djokovic was hitting the ball so, so cleanly. It was breathtaking. And then, he started to get annoyed at something, let his frustration seep in, stopped hitting the ball with the abandon of the first set, and had to go to a tiebreaker to win the match, even though he was up a break before. True, Sam Querrey did improve his game, but it was obvious that Djokovic’s mind started to wander. But…he could be using a new stick. It’s all possible in the murky realm of racquet deals. – then, in that second set against Berdych, we have seen him engage in FH to FH rallies and destroy Berdych’s FH; last year, Berdych average spin of the FH was 15 mph faster than Novak’s; then, against Harrison, he played time and again a “slap” FH, not really flat, but with a lot of spin, on lower bouncing balls. It also seemed that he doesn’t quite control that stroke, since he missed him badly a few times, not only in that match. etc. I tend to believe that the numbers given in the article are close to the real one, or, at least, show a tendency in the evolution of Novak’s racquet: a lighter, more manoeuvrable racquet, that gives more spin and speed. And I think Novak was ready for the change having RG in sight, where more power and more spin could help him win the title. And some of the errors he makes are quite unusual for him, so it makes me believe that he indeed has changed his racquet. mat4, you make a fantastic argument, so I’ll believe you in this case. I imagine you saw the recent demolition of Tsonga – near the end, Djokovic hit a simply filthy ad-court kicker ace. I remember that back in 2008, before the dreaded racquet change that ruined his serve for 2 solid years, Djokovic used to hit his kicker well. But never quite like that. It was amazing to watch.